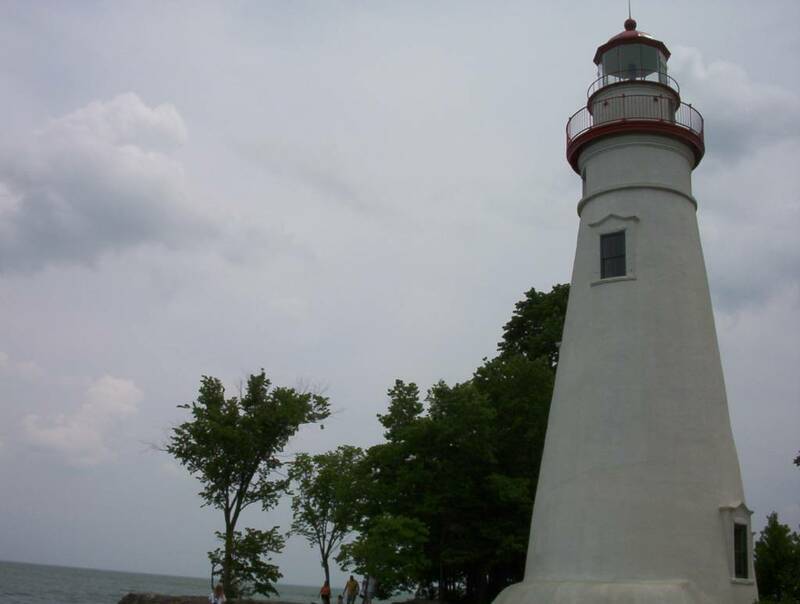 Kelleys Island and Marblehead Lighthouse in Ohio. See all the photos from this album. 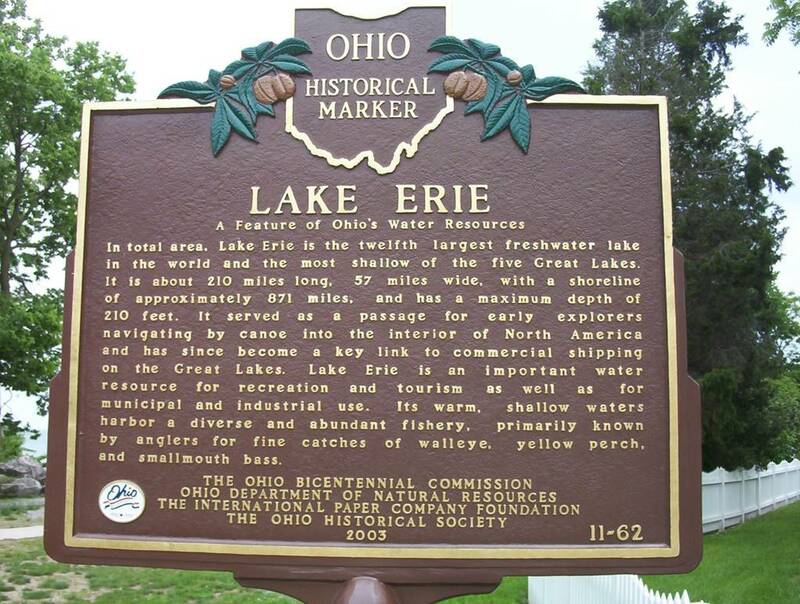 An information plate about Lake Erie, the 12th largest fresh water lake in the world; A lake view street in Marblehead, Ohio. 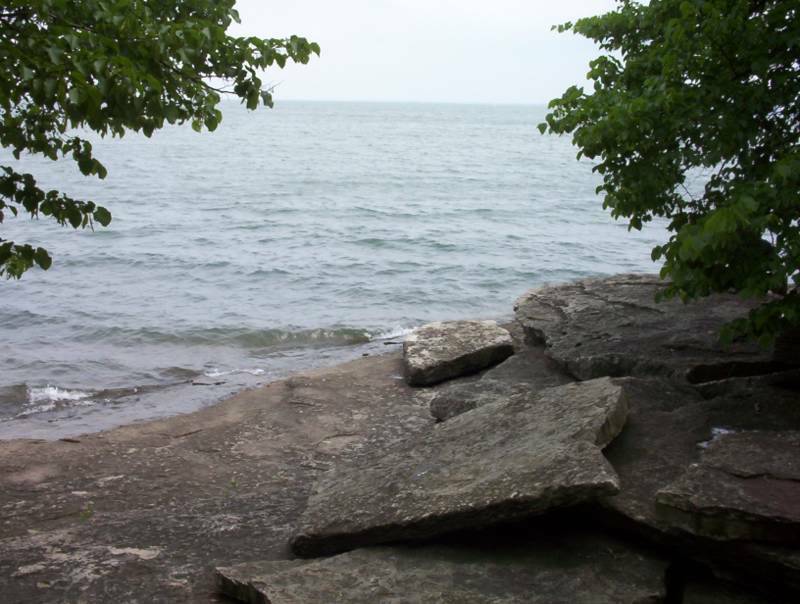 Kelleys Island is a beautiful place which is closer to Cleveland than you may suspect. 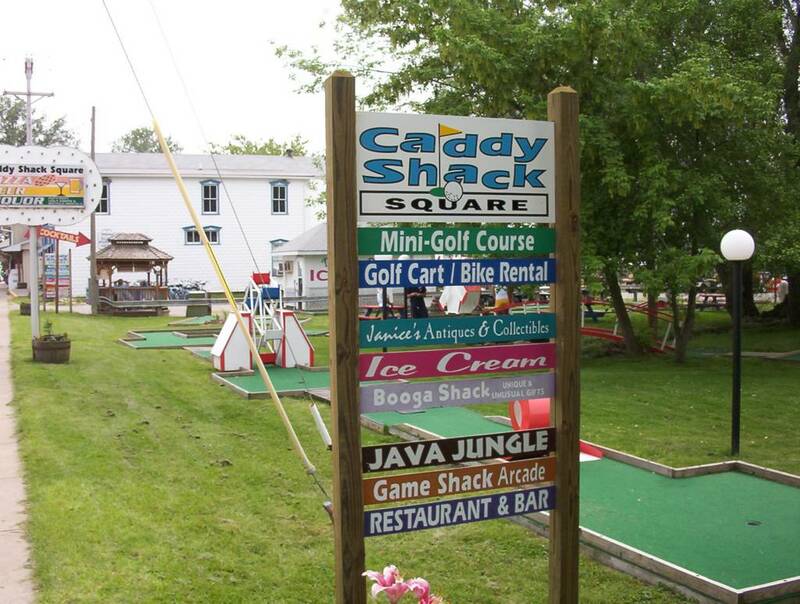 It is a pleasant summer getaway for anybody but especially if you have kids. 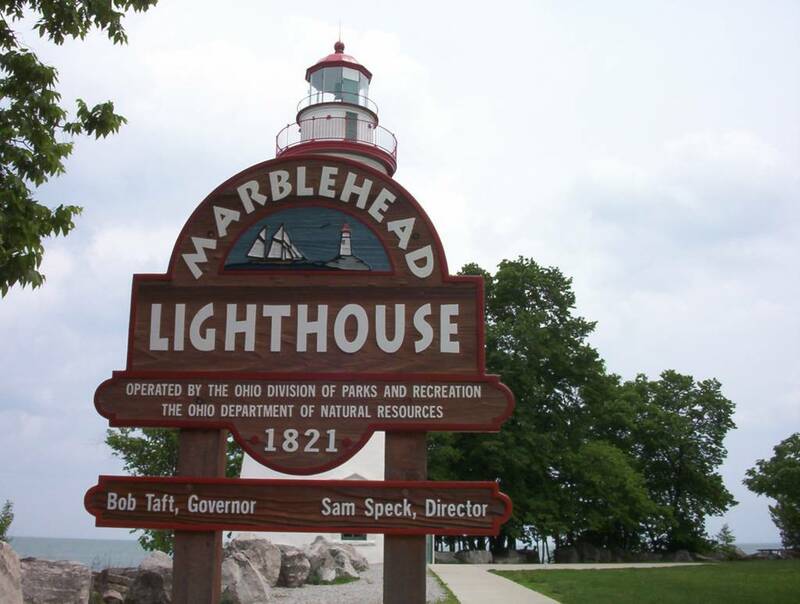 It takes about 1,2-hours to drive to Marblehead from Cleveland: you have to take the Ohio turnpike, and then US-2. 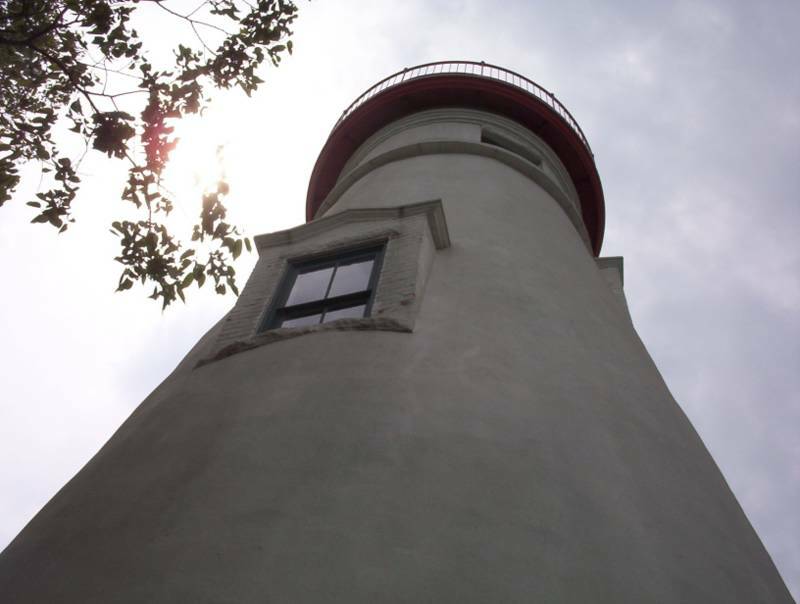 Marblehead has one of the main attractions on the north shore -- the Marblehead lighthouse. 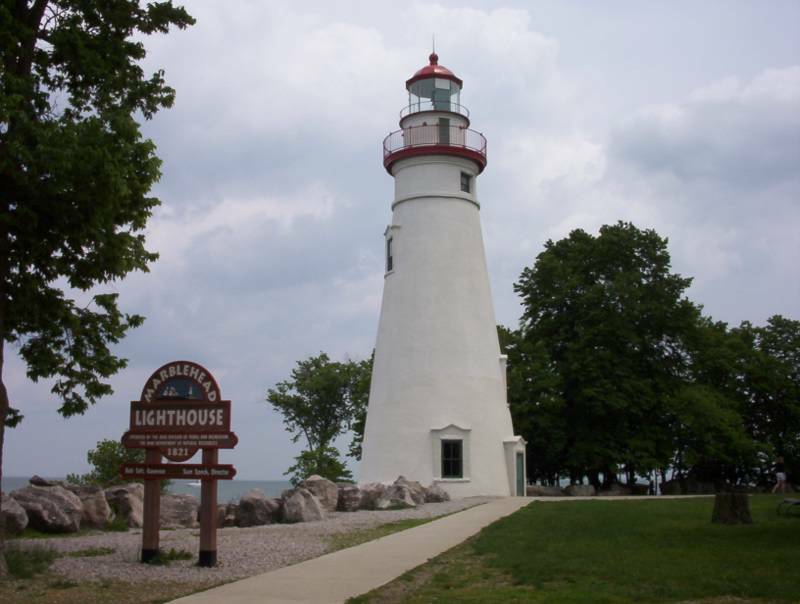 The 77-foot high Marblehead lighthouse was built in 1821 and is one of the oldest lighthouses on the Great Lakes. 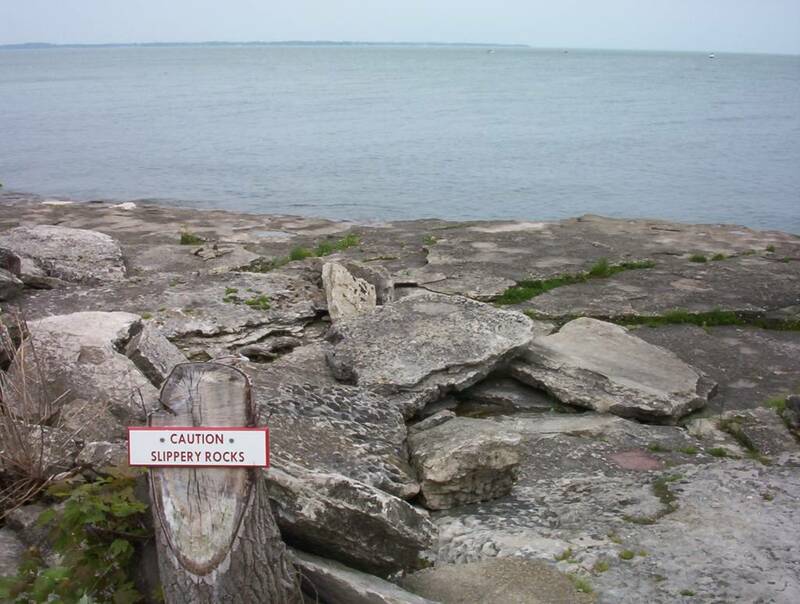 The flat rocks of the shore descend gradually into lake Erie and you can literally step into the lake (not recommended if you cannot swim). 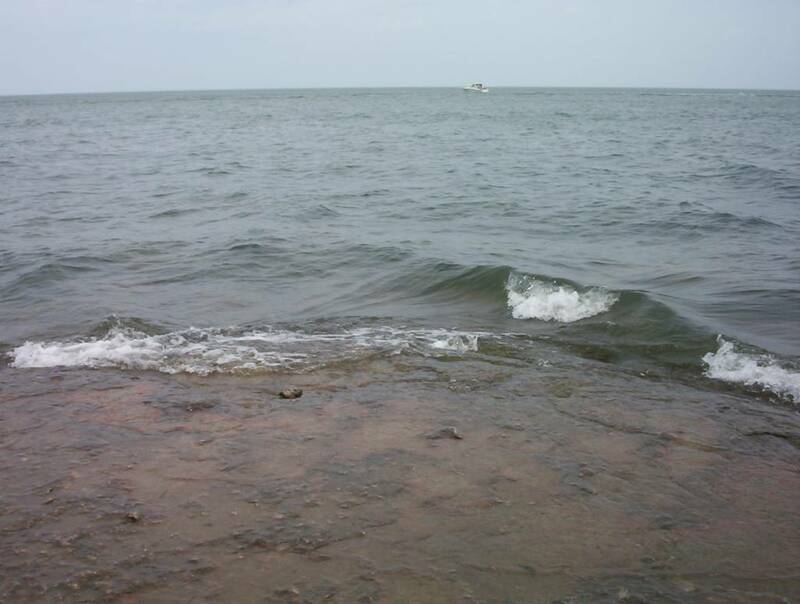 Lake Erie shore at Marblehead lighthouse. 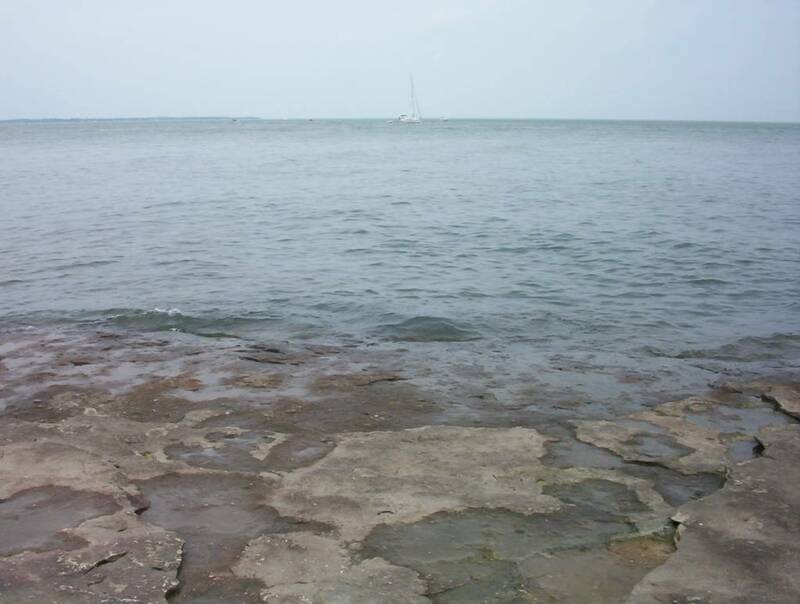 You can spot Kelleys island on the horizon -- a green flat piece of land merging into the blue-green waters of lake Erie. 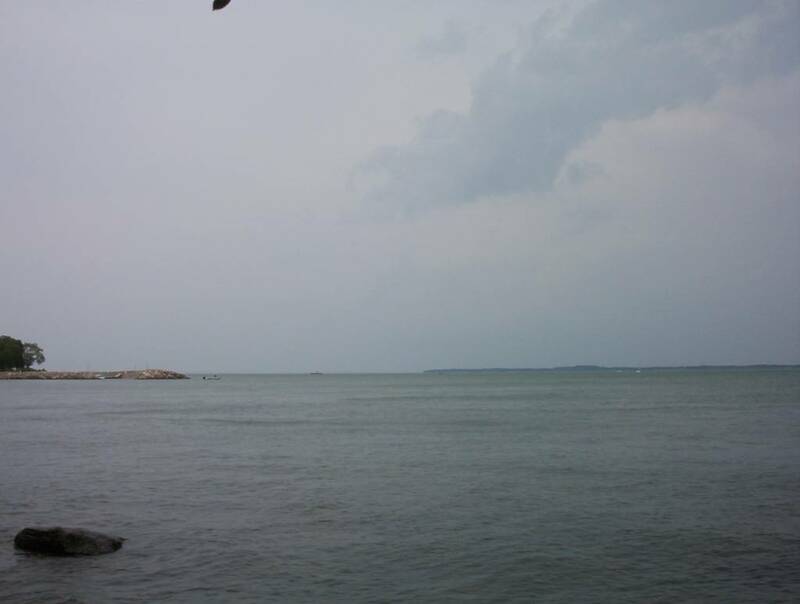 A view of Kelleys island from Marblehead. The best (and only) way to get to the island is the ferry. The Kelleys island ferry dock is conveniently located in the center of Marblehead which is about half a mile drive back on the same road that lead to the lighthouse. Parking is $ 8. 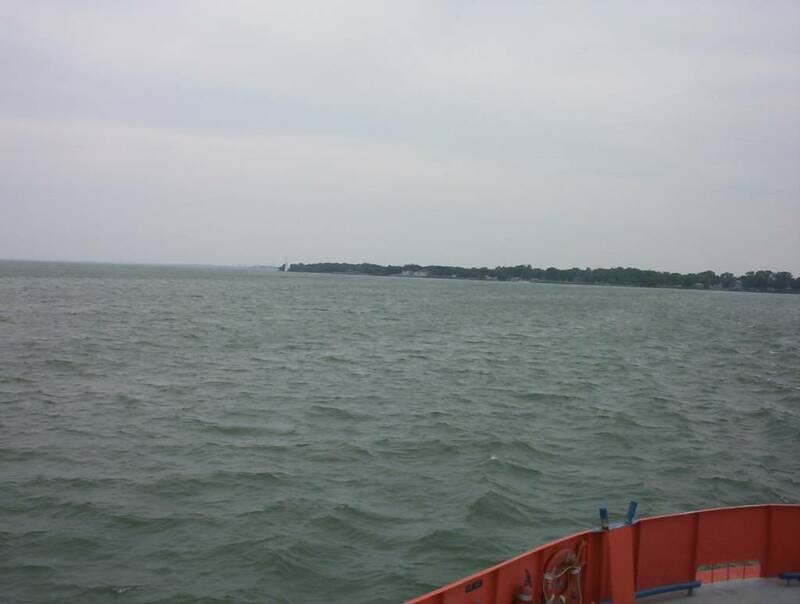 See the other ferry; A view of Kelleys island from the ferry. You have 2 options when you get the ferry -- car on no car. I would suggest not to take your car on the ferry since there are plenty of golf carts to rent immediately after you land on the island. The ferry ride is $14 round trip but if you take your car you have to pay $23 on top of the ticket. It takes 20 minutes to get to the island and you can enjoy the lake breeze on the upper deck. 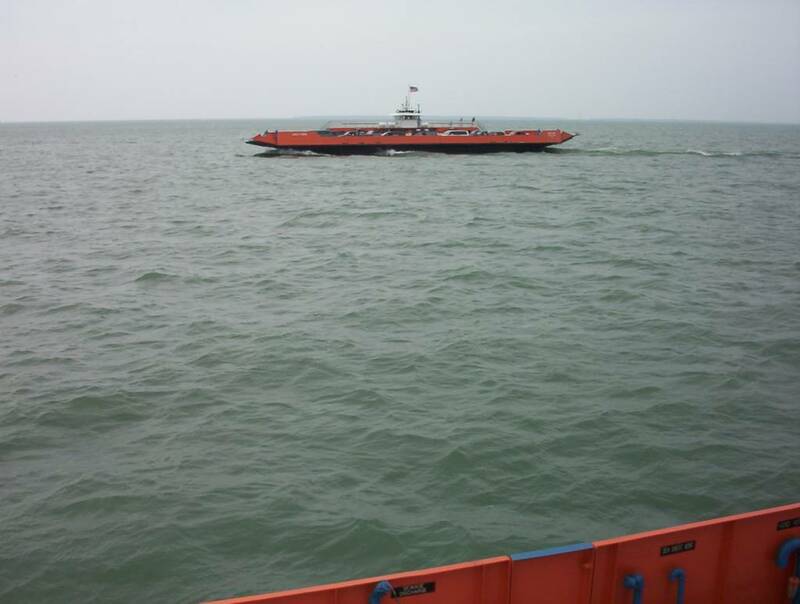 When you sail to the island, you can always see the "sister" ferry passing by in the middle of the distance. After landing, you can rent a golf cart from the fleet of at least 100 immediately on you right at the marina ($ 13 per hour). 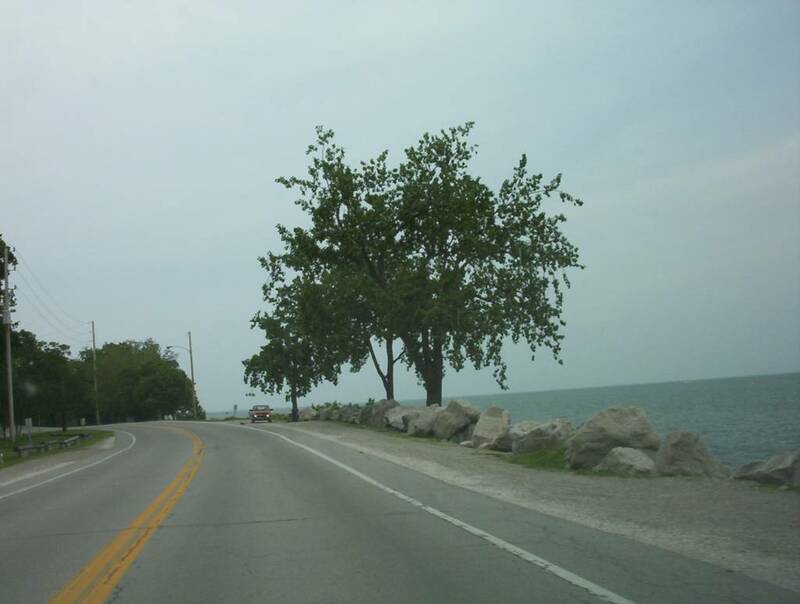 You can walk or drive the scenic Lakeshore Boulevard and after 1/2 mile, you will see the first tourist attraction and historical artifact on the island -- the Inscription Rock. 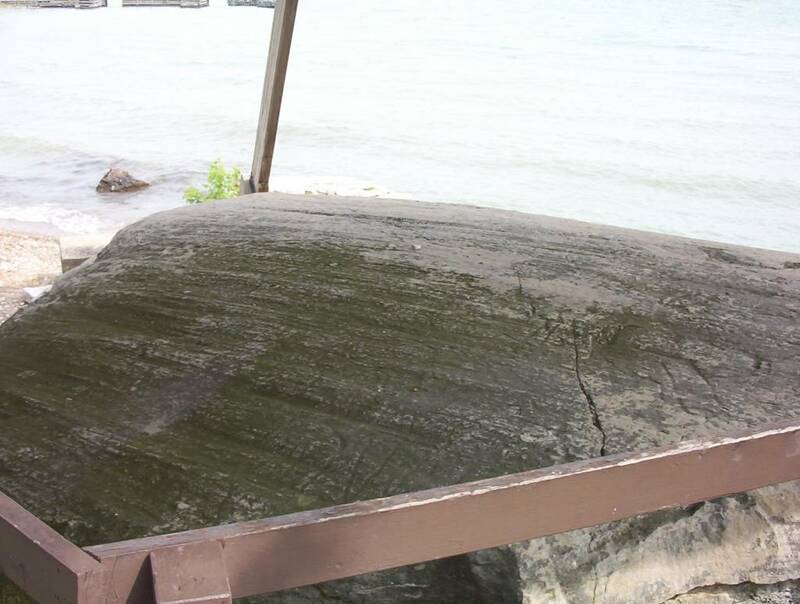 Ancient Indian tribes put their marks on the stone about 300 years ago, a little of it still remains today but you can see a reproduction of the original on a steel plaque in front of the rock. A little bit down road from the Inscription Rock is Kelleys island downtown, which is really a miniature and reminds me of one of those small train station replicas that kids play with. The island got its name from some Mr. Kelley (before that is just had a number, like island number 315) who was one of the first inhabitants 300 years ago. 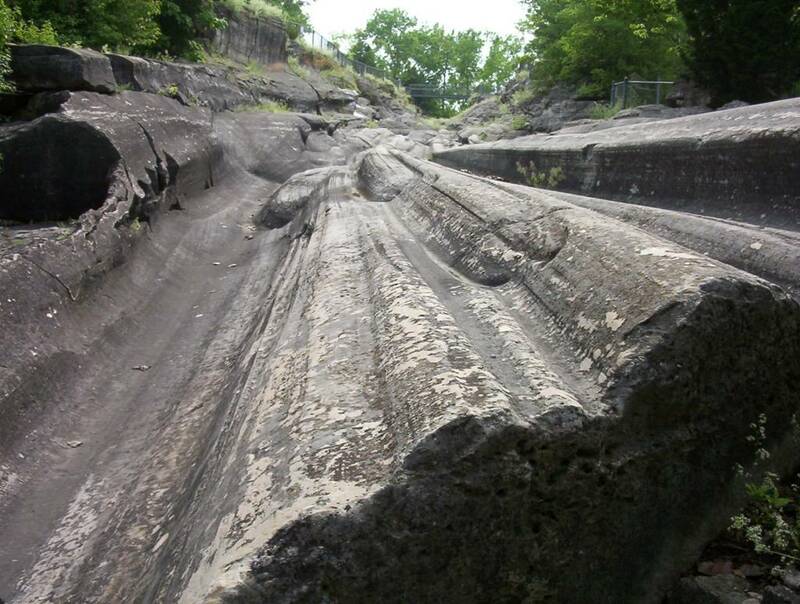 The second most popular attraction on the island are the ancient Glacial Grooves. 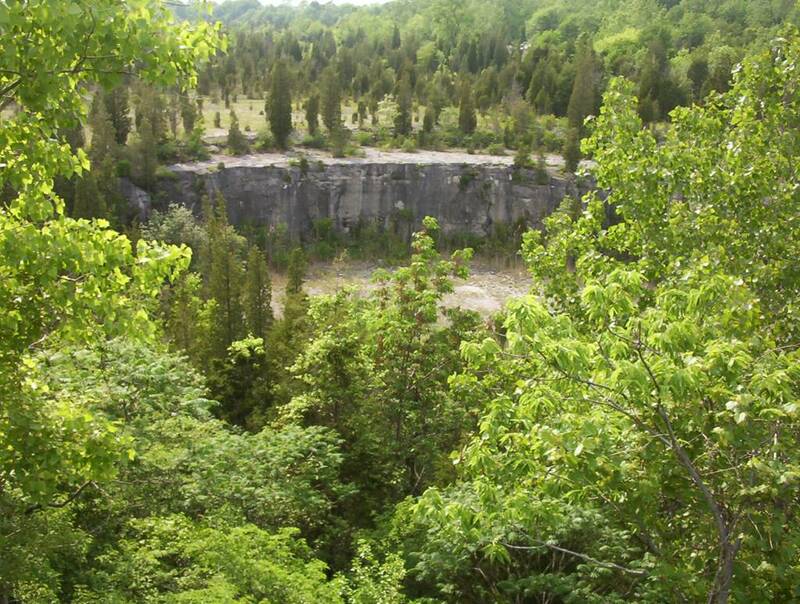 They can be reached via a 3-minute drive from downtown, the road is perpendicular to the Lakeshore boulevard. Just follow the signs and you should find them easily. 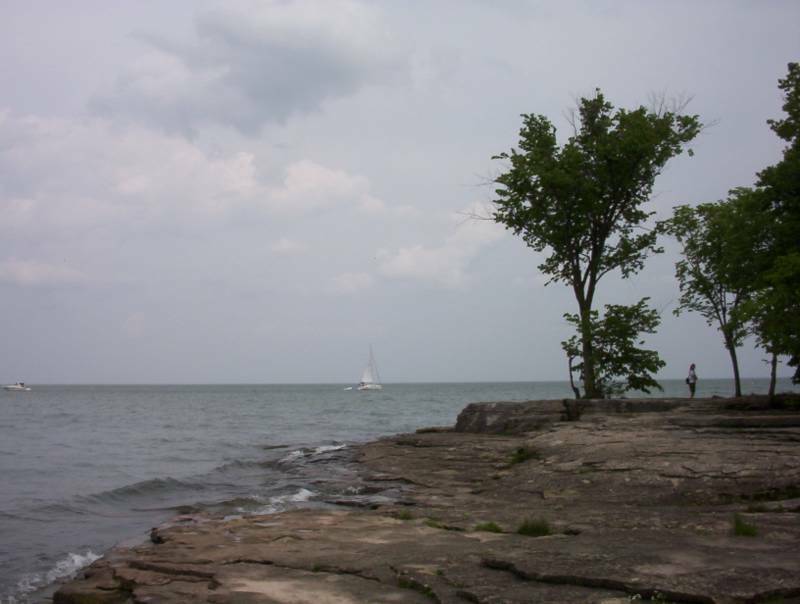 Kelleys island is the biggest island on the American side of the Great Lakes but it is only 4 x 5 miles after all. It is small for a car, big for walking and just fine for a golf cart. For those who are complaining about the cold Cleveland weather -- just remind them that long time ago this area was covered by ice which was one-mile-thick. 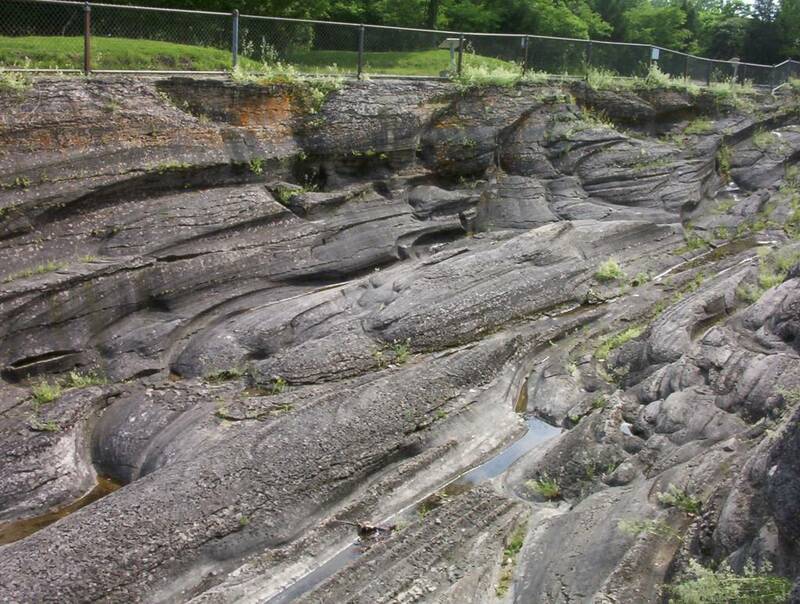 This is how the glacial grooves were formed. The thick layer of ice molded the rocks below it in the shape we see today. When you see it, you will believe it. 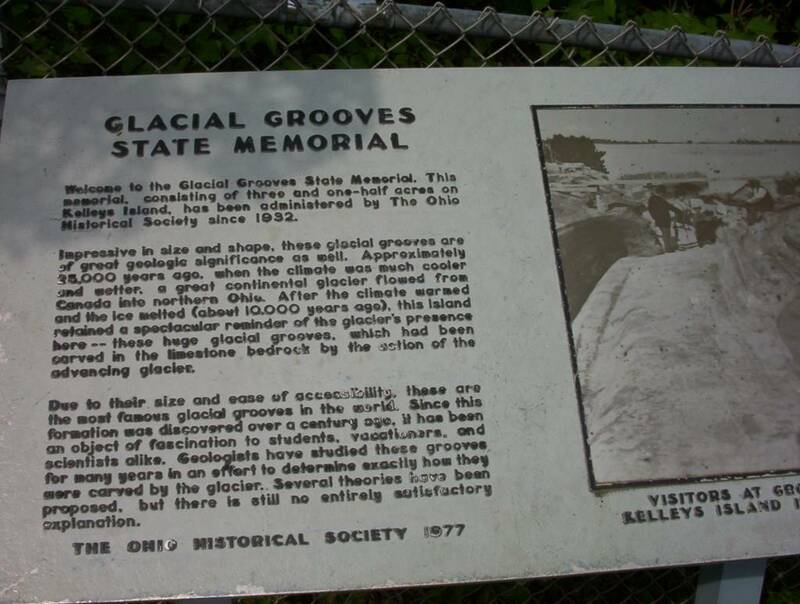 These are the biggest easily accessible glacial grooves in the world, and of course you are not allowed to walk on them. 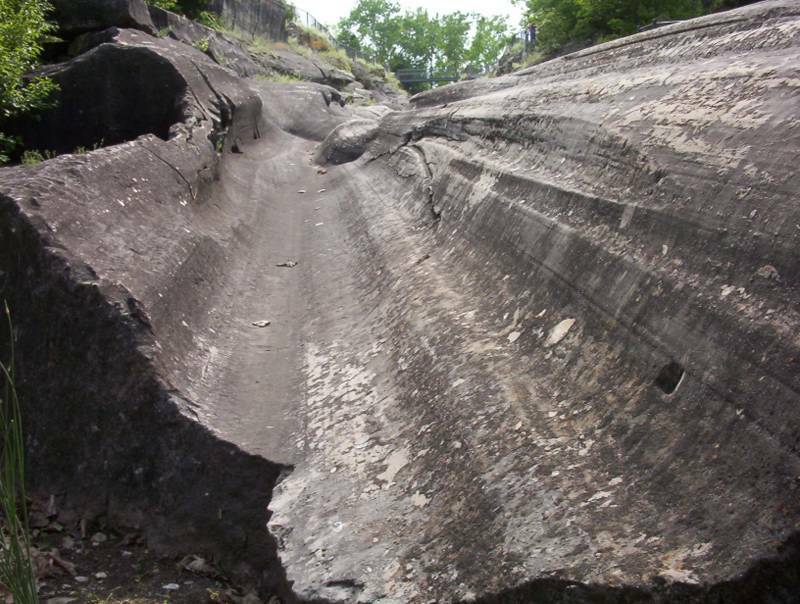 When you are done climbing around the grooves you can go to the nearby beach. The only way back is to take the ferry to the mainland. 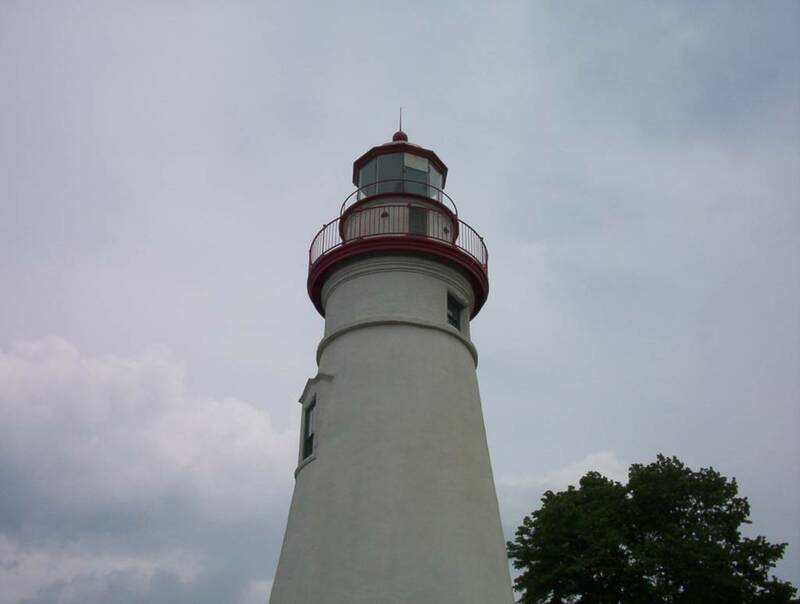 Visiting Marblehead lighthouse and Kelleys island can be a really enjoyable short holiday. Both are very close to Cleveland and you can go there in the morning and come back the same afternoon. Check the directions from maps.yahoo.com, put the address of the Kelleys island ferry. 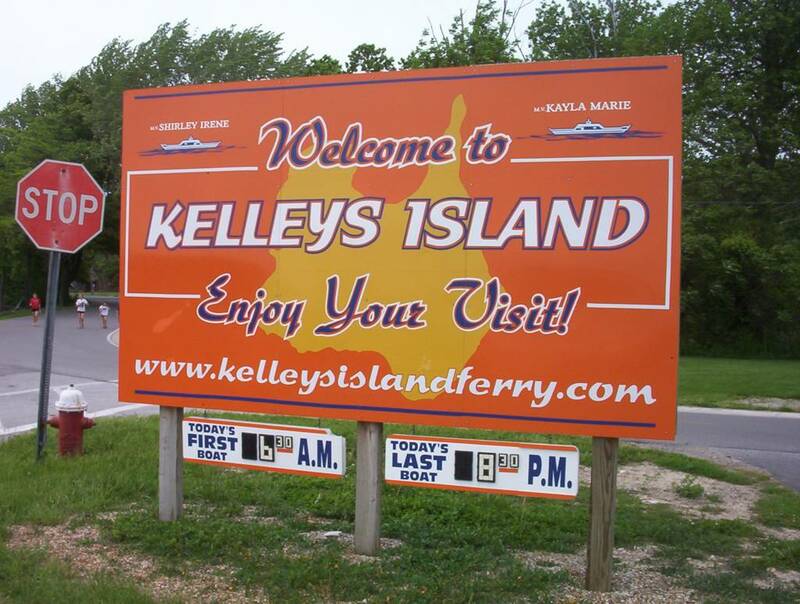 Kelleys island also has a useful website with a very informative map of the island. Sculptor's roots on Kelleys Island supply foundation of an unconventional exhibit. Plain Dealer, Cleveland.com. Video: Kelleys Island on the Today Show. 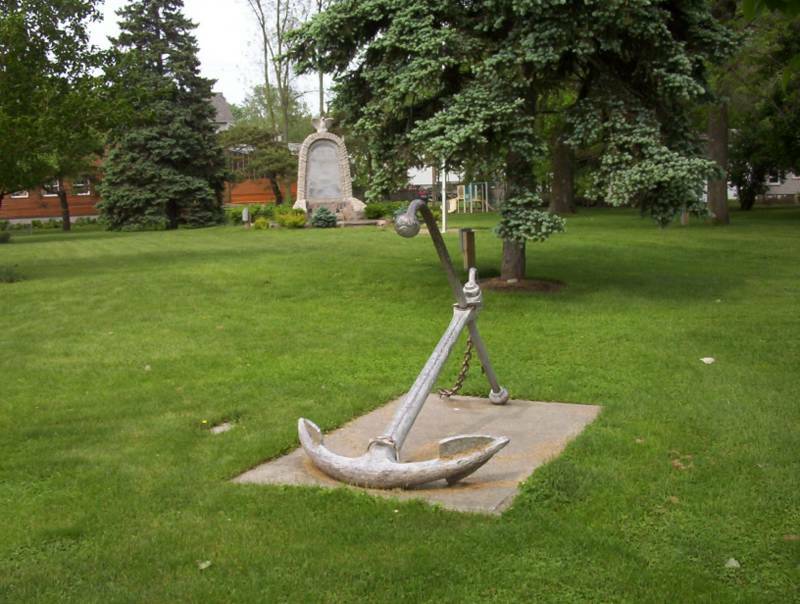 Summer In Marblehead, Ohio. AAA Travel Blog, 2009.